In late February, some of the Bridgewater Learning team attended an excellent presentation titled Agile Decision Making: Decision Making in a Flat Structure by Marius de Beer. This is news worthy not just because the talk was highly thought-provoking, but also because we were there to film it! 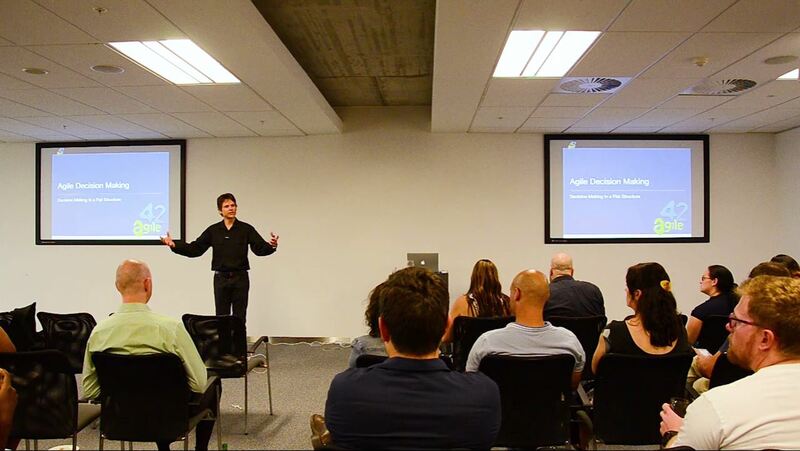 The event was organised by the Scrum Users Group of South Africa (SUGSA) and sponsored by Alan Gray and Agile42. Decision-making in a hierarchical organisational structure is epitomised by excessive caution, uninformed decision makers and inevitable bottlenecks. Marius presents the Agile approach and a flat team structure as an alternative way to overcome these issues. Have a look at the full presentation below. It’s an hour long and well-worth watching. If you’d like to know more about Agile, go here and here. And if you’re interested in our video services please don’t hesitate to contact us.